Hong Kong has more than its fair share of waste even for our 7 million population. In 2012, the world’s cities generated some 1.3 billion tonnes of municipal solid waste (MSW), equivalent to 1.2kg per city dweller per day. And Hong Kong? We produce 1.36kg of MSW per person per day on the domestic side. Shouldn’t we all be ashamed, especially when our neighbours are much less wasteful –Taipei at 1.00kg/person/day and Tokyo at 0.77kg/person/day? Focusing on glass, Hong Kong, at 3%, has the lowest glass recycling rate among developed countries, compared to 90% in Germany, 70% in South Korea and 44% in the UK. The rest of the glass goes into Hong Kong's three landfills, which are predicted to be filled to capacity by 2015, 2017 and 2019. We wine lovers generate significant amount of glass: dinners for 6-8 people with 10-15 bottles opened are not uncommon, not to to mention the truck loads of empty bottles collected at the end of wine events (Wine & Dine, Hong Kong Wine Fair, and the coming Vinexpo). Isn’t it our duty, therefore, to help solve the problem? The Hong Kong Wine Merchants’ Chamber of Commerce recently held a seminar on the Government's proposal for ‘A producer responsibility scheme on glass beverage bottles’ with Dr Alain Lam, Principal Environmental Protection Officer of the Environmental Protection Department, as speaker explaining the scheme, which is a part of the much bolder ‘Hong Kong Blueprint for Sustainable Uses of Resources 2013-2022’. Under the ‘polluter pays’ principle, a recycling fee of about HK$1/litre of beverage content is proposed. Furthermore, the Government suggests that this fee be collected at the supplier level, ie. importers, as this would be much easier to monitor and more effective than trying to do it at the retail or consumer level. While most in the audience supported the recycling initiative, some were concerned about the who and when to pay, and the associated operational costs. From what I understand, these concerns have been largely addressed. Dr Lam stressed that the fee is only collected on first sale, and re-export sales are exempted. To illustrate, an importer who brings in ten 20ft containers (about 120,000 bottles) of wine, re-exports eight containers to China within two months, and only eventually sells 2 pallets (about 2,400 bottles) in Hong Kong over the next six months, he only needs to pay HK$2,400 after 6 months, not HK$120,000 as some think. As to when to pay this recycling fee, the Government suggested a reasonable period of say 30 days after submitting the record. Some thought this too short as they might not have received payment from their customers yet. But if the submission is only made say every quarter, this means importers only need to pay the January recycling fee in April, and I’m sure most importers should have received payment by then. And since the recycling fee is a levy charged by the Government and will be passed along the supply chain anyway, importers can always ask customers to pay it on delivery while normal payment terms apply to the cost of the wine. This is only a matter of changing habits and I’m sure it is doable. To monitor payment the Government would require importers to register. Some smaller traders voiced concern about the registration fee and subsequent administrative work. Again, Dr Lam emphasised that registration is free. And every company, no matter how small, already needs to keep sales records. So I really don’t think the extra workload requires the employment of an army—a slight modification to existing spreadsheets and maybe one more entry line on the invoice may do the trick. There were others who worried about consumer education, wondering in particular whether the collected glass would really be recycled or would in fact eventually end up in the landfills anyway. On this I do think the Government is eager to make it right. They have a major problem in Hong Kong running out of landfill space, so the last thing they want is for waste to sneak back there. With the introduction of the MSW charging scheme, the expansion of glass collection points, and the broadening of possibilities for using recycled glass (eco-pavers, partition blocks, pre-cast concrete products and terrazzo tiles according to research carried out by the Hong Kong Polytechnic University), I think, and I do hope, this will not be a major issue. One optimistic suggestion from the floor was that perhaps the wine industry should be exempted because most of us like to collect empty bottles for display. Well.... only if we drink rare and trophy wines every day! The simple truth is that we Hong Kongers waste too much. Look at all the nearly new television sets consigned to the dump just because an even bigger model came out. And why do bakeries have to put each individual bread bun in a plastic bag and then put the whole lot in another plastic bag? The plaintive arguments of those who say it’s all too hard in Hong Kong are feeble. Cutting out waste at source and recycling vastly greater amounts of all kinds of stuff (glass included) can be done if Governments and citizens put their minds to it. Many, many countries around the world have proved it, and Hong Kong’s efforts look embarrassing and shameful in comparison. You could say it is bad timing for the Government to introduce this programme now because, sadly, most of us don’t trust them much these days, so whatever they say, even the good ideas with good intentions, we tend to object. Well, let’s give them some credit on this one. There will never be a ‘good’ time to start wasting less and recycling more. You just have to start. Improve things by 5% a year and things will look very different in a decade’s time. We are lucky to live in a city with one of the lowest tax burdens in the world. We can afford to pay a bit to push waste management and recycling up to more respectable levels. I think we should stop moaning, stop being selfish, give the Government a chance and do our bit to improve our living environment. 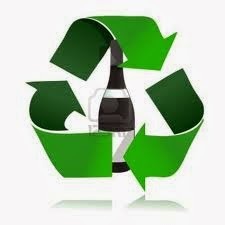 For those who genuinely want to reduce waste, check out HK Recycles. They collect your recyclables every week for a small fee. Swartland Independent? Most would assume it must be a bunch of arty people, radicals, rebels against big corporations. It turns out to be so much more. Swartland Independent is a bunch of wine producers from the Swartland in South Africa, just over one hour’s drive north of Cape Town, but not just any old bunch. It is a group of like-minded winegrowers who believe in the true expression of the region’s terroir and in wines having their own identities. The Swartland, like Stellenbosch, is a wine district in South Africa. Any wine made with grapes grown there can be labelled ‘Wine of Origin Swartland’. But to use the ‘Swartland Independent’ logo, producers must adhere to a set of viticultural guidelines with priority given to the conservation of old vines. The wine must be produced with minimal manipulation, with no use of commercial yeasts or enzymes, no added tannin or acid, and must not be chemically fined. Moreover, Swartland Independent believes that heavy oaking ‘masks’ the essence of grapes, so no more than 25% of a wine may be aged in new wood, and the wood must be of European origin. There are also guidelines on grape varieties. For whites, 90% must be Chenin Blanc, Marsanne, Roussane, Viognier, and specified others, while for reds, 90% must be Syrah, Mourvèdre, Grenache, Cinsault, and more. Commercially popular varieties such as Cabernet Sauvignon, Merlot, Chardonnay and Sauvignon Blanc are not permitted. The producers believe planting grapes on unsuitable terroir only results in wine with inherent limitations. The result? Rhone blend wines from this Mediterranean climate in the Southern hemisphere. The wine is all about natural balance, freshness and purity. The Swartland has some of the oldest bush vines in South Africa but viticulture was long in the back seat as this is traditionally a grain-producing area. Wines were robust and mostly fortified until a new generation of winemakers who believe in making wine that is a true expression of its origin went there to hunt for parcels of old vines. Eben Sadie, one of the leaders of the movement, firmly believes in the diverse soils that the Swartland offers: decomposed granite in the Paardeberg Mountain, clay soils with iron similar to those in the Barossa, slate and schist, calcareous soils, sandstones from Table Mountain and alluvial soils like those found in Graves. It is a canvas upon which grapes can express their true sense of place. Eben praises bush vines with their 360º orientation towards the sun that helps avoid the excessive sun or shading of bunches that can occur on trained vines. And he expends the same effort in the winery. For years, he experimented with fermentation in amphorae underground, a Georgian winemaking tradition, with varying degrees of disaster until he finally mastered the skill. He is now extending the winery to accommodate a few amphorae. I am looking forward to trying those wines in a few years. Swartland Independent has just over 20 members, all family businesses. Some of them, like Adi Badenhorst, ex-winemaker at Rustenberg, gave up their jobs in prestige wineries, while others, like Donovan Rall, still work for established producers but also make some wines of their own. Mullineux is an international team led by Chris Mullineux from South Africa and his wife Andrea from San Francisco. All of them, hands on in both vineyard and winery, gather in the Swartland to live their dreams of making passionate wine. Naturally, none of them has a big production. David Sadie (no relation to Eben) has just one barrel of 400 bottles for his Grenache Noir. 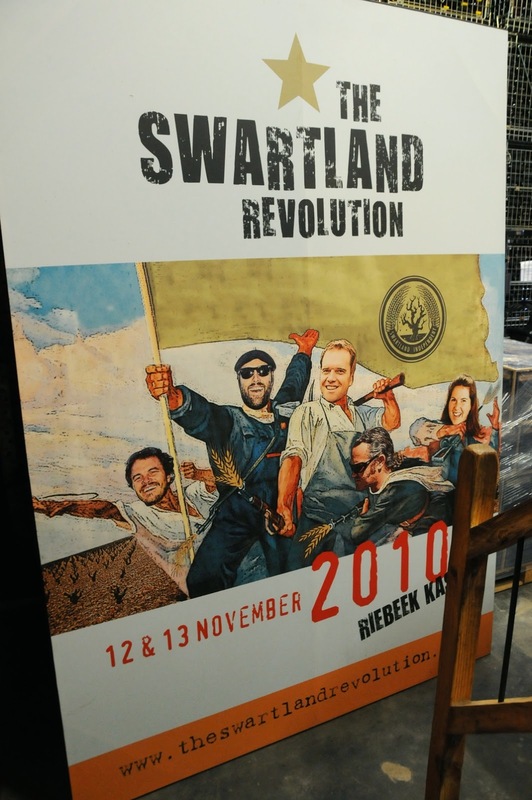 To attract the attention of wine lovers and to revive the image of the region, Swartland Independent organises an annual weekend event called The Swartland Revolution, comprised of tutored tastings, an auction and a braai (South African barbecue) evening that ends with a street-party open tasting. Tickets for last November's event sold out in 52 hours. I am excited by the development of the Swartland and the enthusiasm of these producers. In the wine world, there are mass produced standardised wines that are clean and consistent but lack soul, and there are the premium wines with matching price tags that can only be a treat once in a while for many. To me, wines like those made by the Swartland Independent producers are wines for the true wine lover. We appreciate the fact that grapes are products of nature, and we embrace the different styles, even the not-so-mainstream funky ones. Above all, we respect winemakers who have the commitment, the passion and conviction to make wine that truly reflects the place. Luckily, there is no shortage of like-minded producers in South Africa, and in fact in all wine producing countries. We should be bold enough to step out of our comfort zone and try wines from different regions and producers, including smaller and lesser known ones like these. Only then can we truly enjoy this wonderful drink that mother nature makes possible. The Sadie Family wines is available from Berry Bros & Rudd. Mullineux is available from Berry Bros & Rudd and Vincisive Wines. What a name for a wine tasting event! Only the Italians are romantic enough to come up with such a name for a sparkling wine tasting session ... and it was not a disappointment. What’s more, the tasting was led by Hong Kong based JC Viens, a French Canadian who recently became an Italian citizen because of his passions for all things Italian, especially his lovely wife Maria. His enthusiasm was contagious. If you think Prosecco is only a quaffing wine for making Bellini (a Prosecco based cocktail) or as an aperitif, read on and think again … perhaps you haven’t tried the Conegliano-Valdobbiadene Prosecco Superiore DOCG denomination yet! When sparkling wine is made using the ‘traditional’ method where the secondary fermentation takes place in the bottle and the wine spends some time on lees to produce the toasty and nutty characters (through a process called yeast autolysis). A lot of people dismiss Prosecco as a ‘simple' wine because its second fermentation is carried out in pressurised tanks and it only spends a short time on lees. How wrong this view can be! Prosecco is all about fruitiness, freshness and floral aromas. And the majority of the Prosecco in the DOC denomination may indeed be fairly simple, but those from the Conegliano-Valdobbiadene Prosecco Superiore DOCG are certainly not. This DOCG region, framed between the town of Conegliano in the east and Valdobbiadene in the west, is only 40km wide but has its own distinctive soils and climate. Conegliano is warmer with richer soil producing more structured and fuller-bodied wine, while Valdobbiadene, at the foothills of the Alps with more ancient soils, is renowned for more delicate wines with finesse. To further highlight the quality, the authority has established a 'Valdobbiadene Superiore di Cartizze’ category, equivalent to the ‘Cru’ of the region. It lies in the Valdobbiadene commune comprising a 107 ha rectangle on steep hills. Moreover, a new quality category, ‘Rive’, meaning steep hills, was introduced in 2009 to highlight the stylistic variations between villages. So, Prosecco is not always as simple as it might seem. We tried eight wines from different regions with various sweetness levels (Brut, Extra dry and Dry) and it was a fascinating experience. Each had its distinctive characters reflecting the terroir. Those from the Conegliano area were clearly rounder while the Valdobbiadene had more minerality. 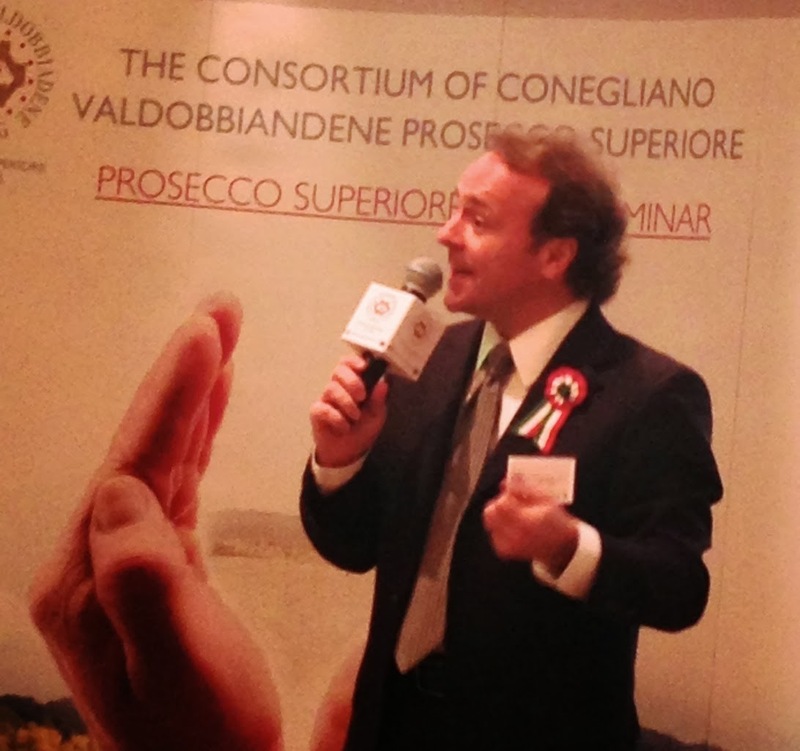 The Conegliano-Valdobbiadene Prosecco Superiore DOCG denomination produces 68 million bottles annually, 23% of total Prosecco production of 300 million bottles (the rest is from the basic DOC denomination). By way of comparison, Champagne produces over 300 million bottles a year and Cava just under 250 million. • Bortolin Angelo Brut for its elegance and floral nose. Available from EnvItaly. • Valdellövo Extra-Dry ‘Annozero’ for its creamy mouthfeel. Apparently it is perfect with spicy Indian food according to both JC and Matthew Stubbs MW. Available from Soho Wines & Spirits. • Marsuret Extra Dry ‘Il Soler’: vibrant and concentrated. Available from Marco Polo Fine Wines. A marketer turned winemaker, I make wine, organise wine events, judge, write about and love wine. I would like to inspire more average consumer to appreciate and enjoy wine in a no-nonsense way. © Tersina Shieh. Simple theme. Powered by Blogger.